Silent reflux is a condition that causes stomach acid to back up into the throat and larynx. The pain that accompanies this condition can make talking and swallowing very painful. Often, this condition is confused with GERD, which is a condition that the contents of the stomach back up. While the conditions sound similar, and present with similar symptoms, silent reflux is not your typical gastro esophageal reflux disease. Unlike GERD, silent reflux does not present with heartburn. 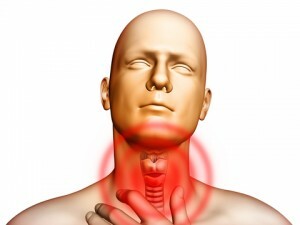 It can be difficult to diagnose, but there are some lpr (laryngopharyngeal reflux) symptoms that will help your doctor with the diagnoses process. If the condition continues, you may see fluid accumulating in the ears, and frequent ear infections can occur. Ulcers can also develop in the throat from the frequent exposure to the damaging stomach acid. In order to correctly diagnose your condition, your doctor will look at your medical history, complete a physical exam and probably order a test or two listed below to determine if you have silent reflux. Endoscopic exam: A thin tube that is connected to a monitor is inserted into the back of your throat to get a look at the tissues in your throat and your vocal cords. PH monitoring: A small catheter will be inserted through your nose and will travel down into your throat and esophagus. The tube will remain there for the next 24 hours, and has connected to a small computer that is worn around the wrist. During this time, the sensors on the catheter will be monitoring acid levels and the computer around the wrist will record the results. The vocal quality in speaking and the technique you use to speak will also be assessed to look for any problems that might be caused by the repeated expose to the harsh stomach acids. Thankfully, this condition is easily treatable, and there are several treatment options and easy-to-follow methods of prevention available to those suffering from silent reflux. When sleeping, keep head elevated 4-6 inches. What Will Happen If Silent Reflux Is Not Treated? Silent reflux may seem like a condition that is just an inconvenience and not something that needs to be taken seriously. However, lack of treatment can lead to serious complications. Scarring in the tissues in the throat and the vocal cords. Lung diseases like asthma, emphysema and bronchitis. An increase of cancer has also been seen in people who had silent reflux that went untreated. The good news is that the prognosis is excellent. With medication and a commitment to a healthy lifestyle, people diagnosed with silent reflux can live a normal life without any serious complications.